Just a thought. That’s all it takes to make it a reality. Some thoughts are weaker than others, but that one seed that’s planted in someone’s mind that may be detrimental to both that person and other innocent people. 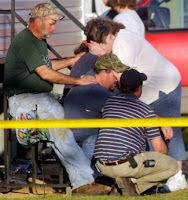 An Alabama gunmen killed 10 people and himself in a shooting spree. So far, they have no motives or reasons why this has all taken place. He went from burning down his mother’s home with her inside, killing his family to ending the lives of complete strangers in various places. It doesn’t make sense. Psychologically, what’s the breaking point of a person when they just throw up their hands and say, “Screw the world and everyone in it?” The family must have played a key role (whether they knew it or not) in the motive of the gunmen. There had to have been extreme, distraught anger that went into complete insanity which took the lives of ten people, including himself. He knew he was going to take himself, but he wanted to leave a mark; some sort of justice needed to prevail. Here’s my question: why this way? Why not make a video of yourself explaining why you’re upset, how distraught you are over it and how it has ruined your life, before going out on these missions? Now, people are left confused and bewildered by the deaths of his loved ones plus strangers. So far, the story isn’t coming to a full head, so probably in a few days we’ll get more details on this. Right now it's all too vague. You’re probably muttering under your breath, “Why is she even making suggestions to people who would do such a thing?” Here’s my theory: people are going to do this regardless of good willed lectures and suggestions. It doesn’t matter. But why go out like that without a “mark”? Why not make a video, throw it on a well known website and tell your story? Forget the other people - let them live in this world. If it were me and I wanted to end my life, a long video would be made. In my deepest depression, I have thought this out many of times. It’s better than a letter - they can see your face, your sadness and feel what you’re feeling through the video. The one thing that baffles me is taking other people down with you. What goes through their minds that they feel a need to kill another person they don’t even know, and worst yet - their own mother? Their family? The people they’ve cared about? Anger will come and go. Forgiveness will come and go - it can't happen at anyone's pace but its own. The thing you thought was most devastating in your life may be a misunderstanding or a complete blessing in disguise. We have to wait it out before reacting. The problem is: one thought turns into another, and then another, and then another, until you have complete chaos. If we can just learn to wait it out 24 hours before reacting to a particular frustration in our lives, it’ll make sense before no time. My thoughts and prayers go out to the family and strangers who have been hurt or killed because of this awful tragedy. Maybe, if we can read the signs of someone who is isolated, depressed and not letting go of past resentments and anger, then maybe we can save lives. These types of things occur in people we least expect it from. Photo provided by Associated Press.